ahh, i love the great music !!! notes : this demo was released at the dexion x-mas conference in odense/denmark (1990). And it ranked the first place !!! i really like the music "animotion" who was original by mantronix and the remixed by tip! i almost forgot this one. spacecut. 3d-bobs. sine scroller. the tunnel that does not work on most amigas. really cool. A classic production from the good ol' days. Except that the music is excellent of course. I haven't actually seen the demo but the music (by Tip) alone is worth a thumb up. 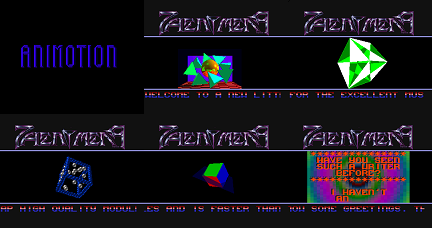 Another kicking piece by the true kings of amiga demos, Phenomena. Top dollar stuff. Great music, great new effects and Celebradil's finest hour. Why is this prod so great that it deserves my first pcdc? 1. This demo invented two new effects --- glenz vectors (also called Celebradil Mode) and space cut vectors. Note that the glenz vectors are morphing too. ManJIT: It's CelebraNdil! :) Great demo! "Celebrandil ,ode" was a joke started by Photon in his "STUNNER Dentro" I recall, and later repeated by others. It was an improved glenz routine with an optional jerky and bugging mode to more closely resemble the original. But the glenz stuff in general was indeed referred to as "Celebrandil vectors" for a while. Cool music and good effects! ugly color combinations, but heck it's still an awesome demo with great music. A real cool prod by Celebrandil, introducing some effects that would become compulsory in later demos. I always liked the black crystal logo for some reason. Looking at it now, I can't really see why. But overall this is top notch anyway. Yeah. The logo impressed me quite a lot back then as well. I really hope someone could change that image... not very representative... and I sounded so cocky in those days! Is that one more up to your taste ? a good production stay a good production same with the time! The logo is sweet. Music great. And I love endless scrollers. Horrible colours :) Still rules though. Legendary! The vectorball scroller and cube spacecut would be copied by PC groups a year or two later. :) Lovely, nostalgic soundtrack. One of the big Amiga demos..
muzak rules aswell, as almost every Tip/Mantronix-Track ! rulez added on the 2010-01-21 09:37:52 by ɧ4ɾɗվ. The music is just HUGE ! Great code, no doubt. But the music, I have no words for this music! To me it's one of the major Amiga tunes, like klisje paa klisje or knulla kuk. Frequent requested a WHDLoad patch for this classic some days ago so here it is. Still an enjoyable demo almost 24 years after its initial release. Excellent code and awesome tune! Great music, great logo, great demo. Nice guy Havoc pixeled the logo for us on a party in Sweden before this... memories! One of the first demos I watched on my Amiga when I was at school. True classic! I usually hate this stuff with a passion, but there's actually nothing heinously ugly here and the track is very good, excellent even! A massive thingy for the time (by ZAZNOMZNP as it says on the logo). page created in 0.022563 seconds with 15 queries.